The NBA National Elections are scheduled to take place this month, on 27/28 July 2018, and it has fallen on the Eastern Zone (as defined by the NBA) comprising Anambra, Enugu, Imo, Ebonyi, Abia, Rivers, Bayelsa, Akwa Ibom and Cross River States to produce the President of the Association pursuant to the NBA Constitution. For the purposes of producing its President, the NBA divides Nigeria into 3 (three) Geographical Zones – Eastern, Western and Northern Zones – and rotates the office between these 3 (three) zones. The tenure of the NBA National Officers is fixed by the Constitution at 2 years and the President sits at the apex of the National Executive Council. There are three contestants for the office who have been cleared by the Electoral Committee of the NBA ("ECNBA") and these, in the order of seniority both at the Bar and the Inner Bar, are Paul Usoro, SAN from Akwa Ibom State, Ernest Ojukwu, SAN from Abia State and Arthur Obi Okafor, SAN from Anambra State. The entry of Paul Usoro has caused considerable consternation in the ranks of some members of the Eastern Bar Forum ("EBF"), a voluntary grouping of lawyers, with membership drawn from the pool of lawyers who hail from and are indigenes of the NBA's Eastern Zone. Their contention is that there is an unwritten convention between the members of the EBF for the office of the NBA President to rotate between the South-South States in the Zone (Rivers, Bayelsa, Cross River and Akwa Ibom States) and the Igbo States (Anambra, Enugu, Imo, Ebonyi and Abia States) each time that the office circles round to the Zone. They also point out that Okey Wali, SAN from Rivers State was the last occupant of the office in 2012 when the NBA President's office rotated to the East. For the 2018 Elections, the EBF has adopted one of the 2 candidates from the Igbo States and have waged a vicious campaign against the other two and in particular, Mr. Usoro. (a)	EBF and NBA Constitution. The NBA Constitution neither recognizes EBF nor its afore-stated unwritten convention; as far as the Constitution is concerned, any lawyer from the Eastern Zone is qualified to contest for the NBA President's office when it is the turn of the Zone to produce the President. 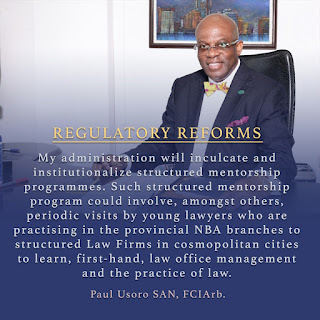 That explains the clearance of Paul Usoro by the ECNBA, alongside the other two aspirants, for the contest. Furthermore, unlike NBA, membership of EBF is not automatic or mandatory; EBF is a voluntary association of lawyers from the Eastern Zone. There is indeed a significant number of lawyers from the Zone who are not members of the EBF but are mandatorily members of the NBA. Paul Usoro is one of such NBA members who is not a member of the EBF and therefore not bound by the EBF Constitution and its unwritten conventions and practices. The secretariat of EBF confirmed membership is fewer than 400 persons, meaning more than 90% of lawyers from the former Eastern zone are not members of the EBF. This emphasizes the absurdity of such insignificant number to impose Leadership on over 160k lawyers in Nigeria. (c)	"All-Inclusive Bar". At a time that the Igbo States are calling for inclusive national policies and politics, the discriminatory attack on Paul Usoro is a very sad commentary on the EBF and its membership. It simply depicts the proponents of the EBF position as persons who do not believe in an all-inclusive Bar particularly where such inclusiveness favors the minority States of Akwa Ibom and Cross River States. Instead of accommodating the yearnings of Akwa-Cross for inclusion, the EBF apparatchik have resorted to blackmailing, browbeating and name-calling Mr. Usoro and his supporters, all in an effort to intimidate him out of the race. Even with Mr. Usoro as the President of the NBA in 2018, the Igbo States would still produce, in the aggregate and historically, the highest number of NBA Presidents of Eastern Zone origin viz-a-viz the minority States of the Zone. (d)	NBA Constitution. On the issue of rotation, the NBA Constitution admonishes that "where a position is zoned to any particular geographical zone, the position shall be rotated and held in turn by the different groups and/or sections in the geographical zone". This provision clearly favors Akwa-Cross States that have never produced an NBA President in the history of the Association particularly considering the historical tripod that makes up the NBA's Eastern Zone. It would perhaps have been a different situation if no candidate emerged from Akwa-Cross or if the minority States of the East had, in the aggregate produced as much number of NBA Presidents as the Igbo States. (e)	Doubtful EBF Unwritten Convention. The so-called EBF unwritten convention of rotation and adoption of candidates is of doubtful existence. In 2006, Chris Uche, SAN from Abia State contested against Olisa Agbakoba, SAN from Anambra State and Funke Adekoya, SAN from the Western zone for the NBA President's office. When Okey Wali, SAN contested for the Presidency of the NBA in 2012, Emeka Ngige, SAN from Anambra State contested against him and almost won that election. Even in this 2018 Elections, until the recent disqualification of Afam Osigwue from Anambra State by the ECNBA, there were two other aspirants for the NBA President's office, apart from Mr. Usoro. Currently, there are two Senior Advocates of Nigeria from the Igbo States who are contesting for the office with Mr. Usoro notwithstanding the so-called EBF adoption of one of them. (f)	"Shoo-in" President. EBF rotation and adoption principles eliminate contest and deprive NBA members of choices and in the process makes a complete mockery of the election concept. As earlier mentioned, the EBF has adopted one of the 3 (three) contestants for the office of the NBAS President and has written to all the other NBA Zones and regional groupings to follow suit and adopt its anointed candidate. On this account, the EBF and its members have waged a vicious and relentless campaign mostly against Mr Usoro for daring to contest the office. The EBF in the process arrogates to itself the right to make a choice of the NBA President for the entire NBA electorate made up of 3 NBA Zones holding all together over 30,000 lawyers/members. With the greatest respect, that is very arrogant and presumptuous of the NBA apart from being anti-democratic, wholly unfair and contrary to all known principles of equity and good conscience. Little wonder that the EBF adoption has been rejected by other regional fora and groups. (g)	Professionalism and Competence. One would have thought that the EBF which purports to be a regional grouping of lawyers, would extol competition amongst qualified lawyers from the Eastern Zone for election as President of the NBA and lay emphasis on professionalism and competence as the most critical qualifications therefor. In that regard, it bears pointing out that no one has suggested, even remotely, that Mr. Usoro is not vested with the skills, competence, sagacity and God-endowed wisdom to pilot the affairs of the NBA as its President. Indeed, everyone including the EBF proponents are agreed that he is amply endowed in that regard and would, as President of the NBA, make the Association very proud, not least, the EBF and its members. (h)	Seniority at the Bar. The legal profession lays emphasis on seniority and Mr. Usoro is older in all respects – biological age, age at the Bar and age in the Inner Bar – than the other 2 (two) aspirants for the NBA President's office. Clearly, by the culture of the Bar, he should take precedent over the other two in all respects. These facts fully rebut the ongoing vicious campaign against Mr. Usoro's candidacy for the NBA President based solely on the purported EBF unwritten policy of rotational adoption of Presidential candidates. Happily, the ECNBA has not pandered to the EBF in that regard. By clearing Mr. Usoro for the elections, the ECNBA is setting a standard in the conduct of competitive elections that lays emphasis on the quality of the candidates and the presentation of credible choices to its electorate.